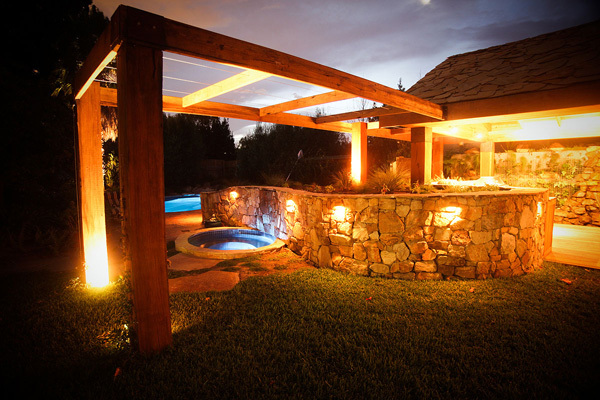 Despite having a fairly established garden with mature trees and feature plants, this client wanted to enhance the presence of their suburban space and highlight specific garden areas. 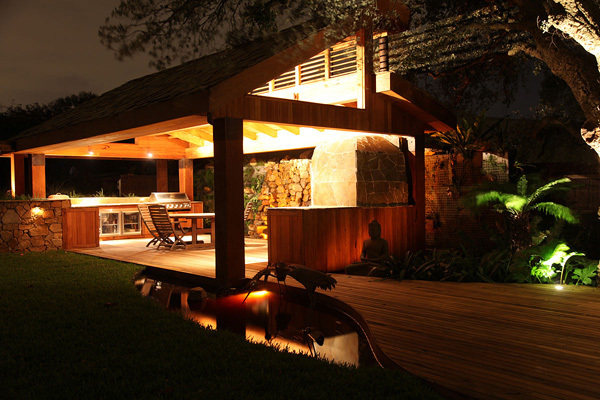 A key feature of this broad scale garden design was a standalone alfresco entertaining pavilion capable of accommodating a moderate number of guests. 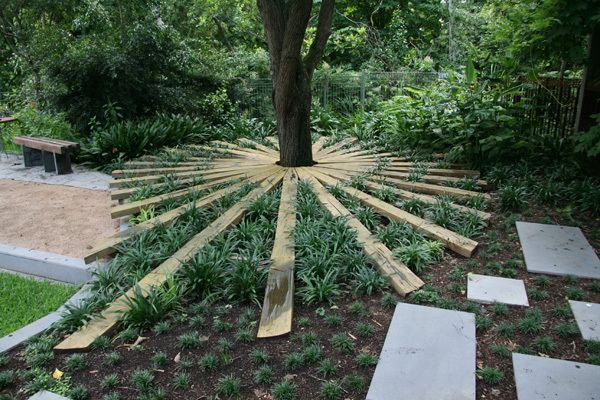 The project began with the installation of a 50,000 litre water tank, sufficient for a garden of its size. 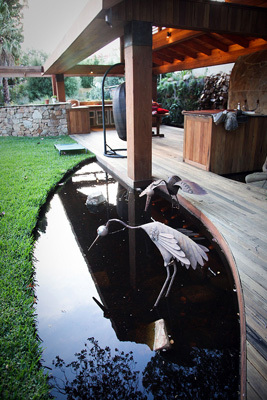 The tank is plumbed to catch the water from the entire roof surface of the house. It is also connected to a pit at the lowest point of the property where natural runoff is caught and pumped into the tank. 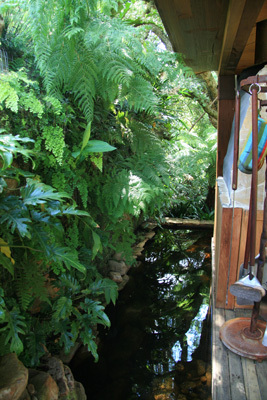 This water is then used to irrigate the garden. 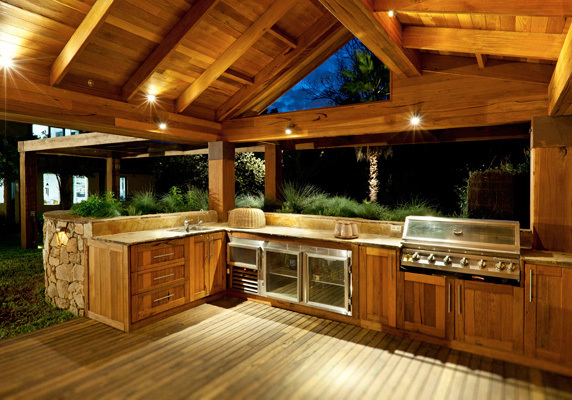 A complete alfresco kitchen and entertaining pavilion was then constructed separate to the house. 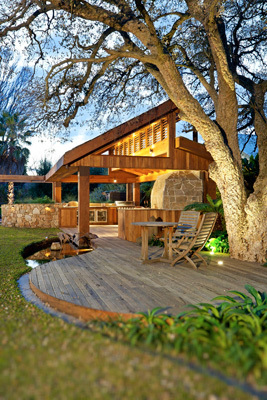 All the wood used for this elaborate structure was reclaimed local Australian timber which delivered an environmental benefit and provided an inviting, rustic feel to this section of the garden. 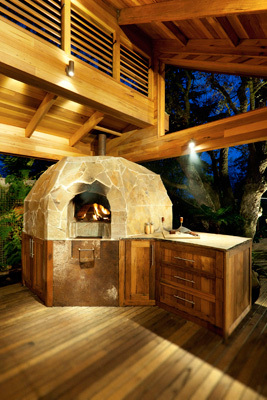 This one-of-a-kind alfresco also included a custom built wood fired pizza oven, fridge, sink and gas BBQ with which provides a fully self-sufficient entertaining facility. 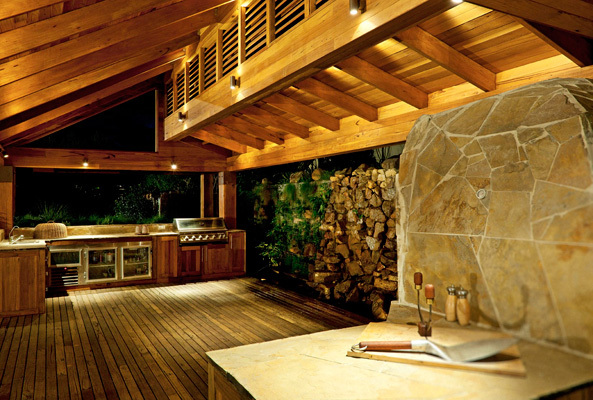 The bench tops, pizza oven and roof of the alfresco where all externally covered with slate to complement the aged and rugged feel of the timber. 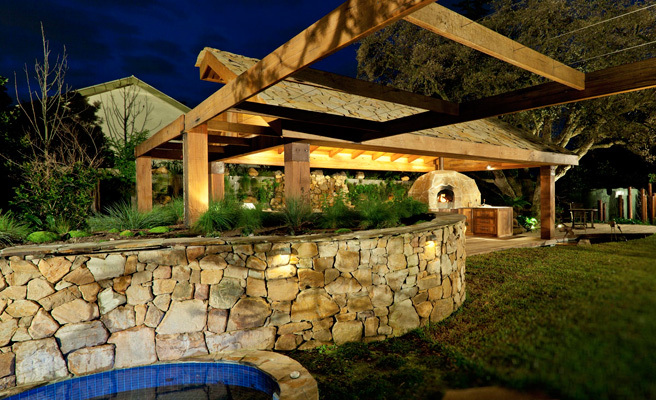 Encircling the alfresco pavilion is a natural pond, layered with sand and rock to compliment the surrounding landscape. 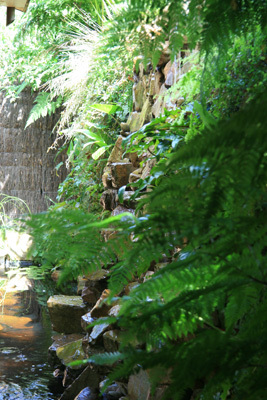 Partially submerged within this pond stands a living wall divided by a stunning natural rock cascade. 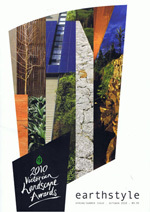 The living wall was designed and constructed to reflect the flowing shape of a secluded natural waterfall. The waterfall design leads the viewer to believe the cascading water is fed by an upstream river just beyond the crest of the living wall. 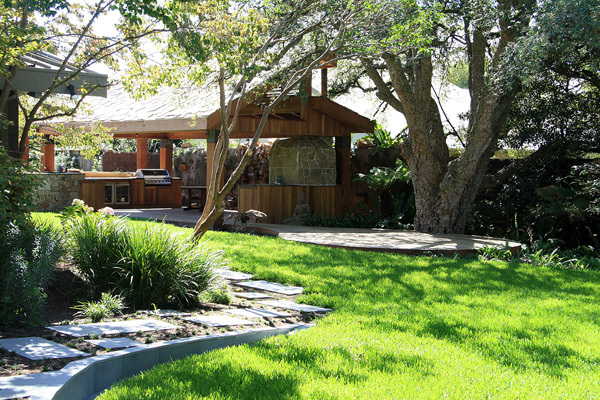 A sophisticated filtration system enables the pond water to circulate through the living wall, dispersing moisture and nutrients along the way to an abundance of striking plants. Laden with nutrients from the resident fish, the water is continually pumped and filtered to remain clean and well oxygenated making this suburban ecosystem completely self sustainable. 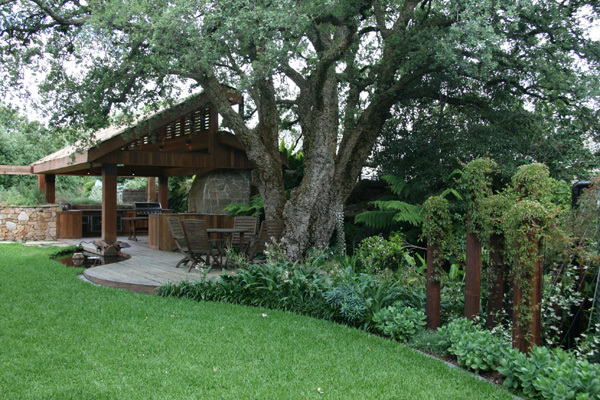 Bridging the pond at the eastern end of the alfresco area, a circular deck protrudes out into the garden to encompass a well established cork tree. 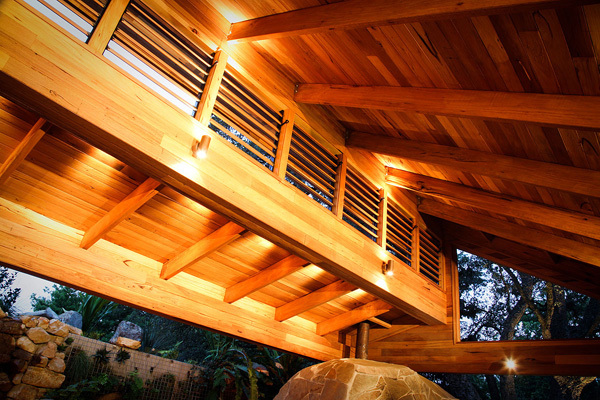 A particular favorite of the client, this tree now takes centre stage with night spotlights recessed into the sweeping hardwood deck floor. 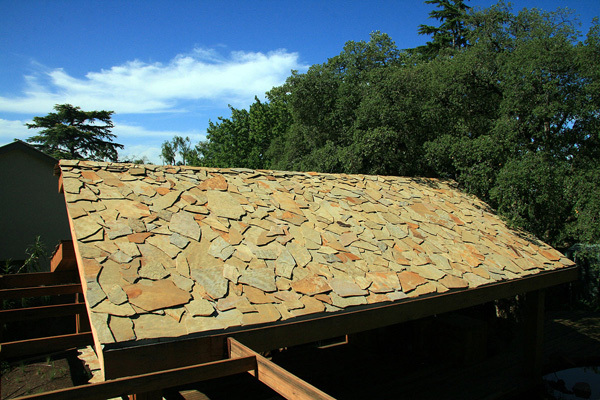 Dry stone walling was used to link the western end of the alfresco with striking textures and flowing lines into the pool and spa area. 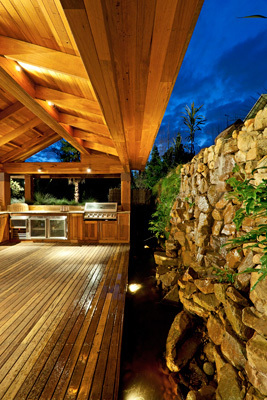 This garden feature draws the viewer's eye from the stone paved alfresco bench tops, along the dry stone wall, down the small cascade into the slate covered spa. 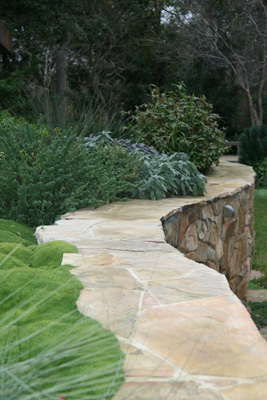 This imposing wall feature also serves the purpose of retaining soil for a native garden bed. 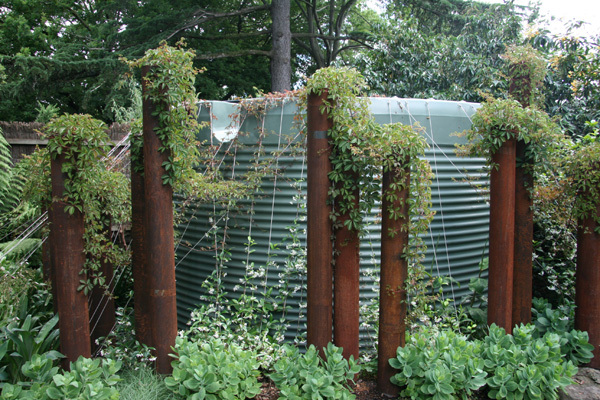 Further east of the cork tree deck, abstract pipe-work art was effectively used to shroud the semi-submerged water tank. 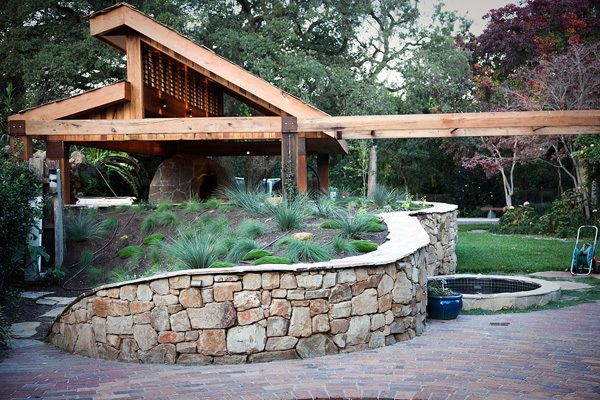 Low-level bluestone walls were also constructed with sweeping lines to create a raised Bocce pit and broad lawn area. 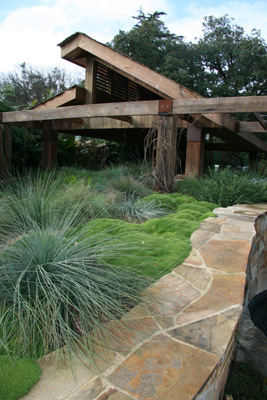 The turf variety used throughout the garden was the drought tolerant Sir Walter Buffalo turf which provides excellent wear resistance (perfect for entertaining) and moderate shade tolerance. 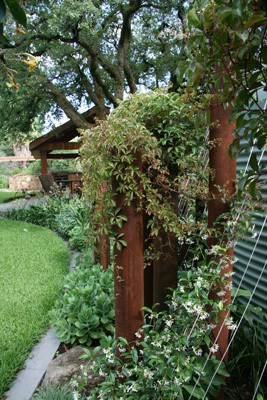 Pathways connecting different areas of the garden were constructed using steppers rather than solid paths as this reduces run off, erosion and allows a greater amount of rain water to enter the soil. 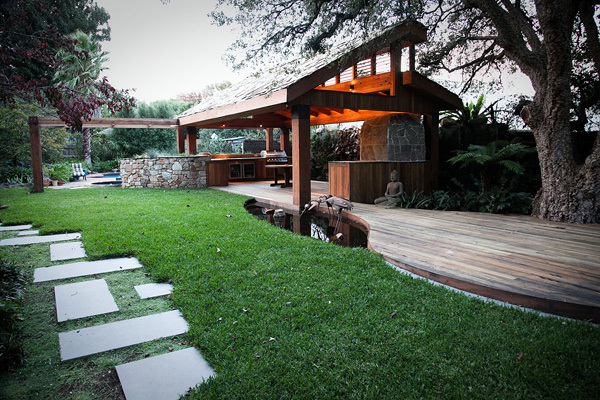 The client's vision of the perfect entertaining garden was realized through careful planning and clever design initiatives. 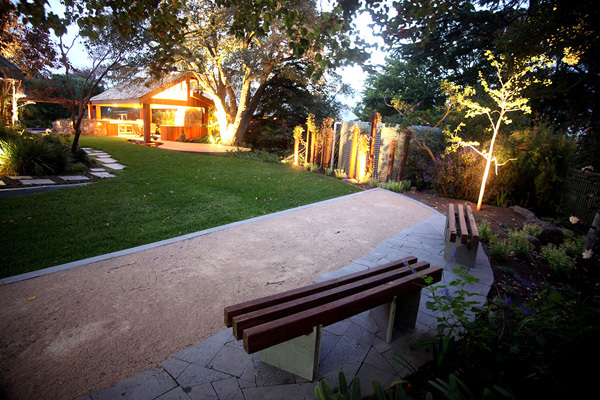 Highlighting established garden features while successfully integrating new structures and garden zones has provided a broad scale oasis tucked into the leafy suburbs of Melbourne.